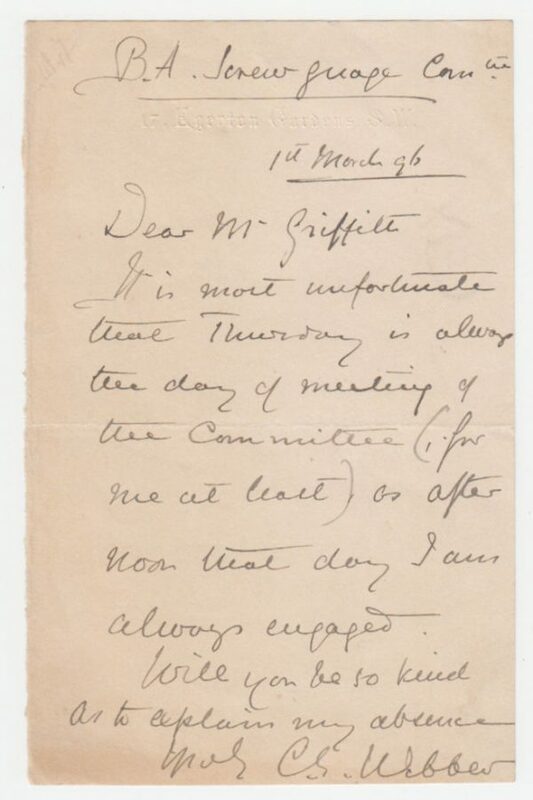 Autograph Letter Signed, to Mr. Griffith, regretting Webber’s absence from a committee meeting. 1 page 6 x 4 inches, in good condition, light toning. 17 Egerton Gardens, 1 March 1896. Major-General Charles Edmund Webber (1838-1904), Royal Engineers, was employed by the Post Office (1869-1871) to assist in the construction and organisation of the Telegraph Service. He served in the Indian Mutiny (1857-59), the Zulu War (1879) and the Egyptian Expedition (1882). He accompanied Sir G. Wolseley to Natal in May, 1879. He was appointed A.A.G. and A.Q.M.G. of lines of communications under Major-Gen. Clifford on 28th June. Was Senior Staff Officer for the lines from Natal through Western Zululand from that date until the final evacuations in Sept., including the superintendence and local direction of the execution of the orders for the breaking up of the 1st Division and the formation of new columns, followed by the final evacuations and removal of the army and all its material from the forts and positions of Zululand and on the frontier of Natal.